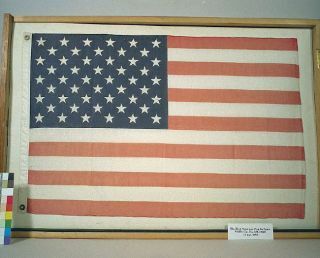 The first American flag in space, flown nearly a year after the nation adopted of the 50-star version on July 4, 1960. Fiftyyears ago today, on Independence Day 1960, the United States officially adopteduse of the 50-star American flag, increasing the star-count by one to recognizeHawaii's statehood. This, the 27th update to the star-spangled banner, becamethe U.S. flag to be longest used and the only one to represent the nation inspace. Despitehaving launched satellites for two-and-a-half years prior to the 50-star flagbeing unfurled, the country's first flag did not enter space untilnearly a year after the banner was introduced. Thefirst U.S. satellite, Explorer 1, was launchedon Jan. 31, 1958 without the stars and stripes adorning its or its Juno 1rocket's body. Once it was confirmed Explorer was in orbit, its designersannounced their success at a press conference, lifting a replica of theman-made moon above their heads. Anow-famous photo captured William Pickering, James Van Allen, and Wernher vonBraun hoisting the full-size Explorer1 model adjacent to a 48-star American flag. Thefirst U.S. probe to enter space after July 4, 1960, was Echo 1A, a Mylarinflatable 'satelloon' that was launched on August 12, 1960. Its ride to orbit,the first successful Delta rocket to fly, was decorated like other boosters ofits day. The rocket had "UNITED STATES" stenciled on its side, but noflag. Thefirst 50-star flag to fly in space ? indeed, the first American flag have everleft the planet ? did so in May 1961, alongside another U.S. first: AlanShepard, the first U.S. astronaut in space. Thefirst American flag to ride the "rocket's red glare" did notoriginate with the President or Congress, or even from NASA officials. The manwho would fly on the suborbital mission with the banner, Alan Shepard, was evenunaware that it was onboard. The23- by 36-inch cloth flag came instead from a school located near CapeCanaveral, Florida, where the flag and Shepard would launch aboardMercury-Redstone 3 on the spacecraft "Freedom 7." "Thestudent council president and the principal of Cocoa Beach School near theFlorida launch site gave the flag to a reporter, who in turn gave it to thehead of the NASA Space Task Group, Robert Gilruth, with the request that it beincluded on Mercury-Redstone 3 (MR-3), if possible," according to adescription on the Smithsonian's website. "The flag was rolled up andstuck in a wiring bundle in Shepard's spacecraft, Freedom 7, although he wasnot aware that it was there." "Afterthe mission, Gilruth returned the flag to the school, which was later calledthe Freedom 7 School." In1984, after the school closed, the flag was donated by the Brevard County Boardof Education to the National Air and Space Museum. ButMercury 3 was not the only flight for the first U.S.flag in space. It reached orbit onboard the 100th U.S. manned flight,STS-71, which also marked the first docking of a U.S. space shuttle to Russia'sMir space station. Afterreturning from space in 1995 for a second time, the flag was presented byShepard and STS-71 commander Robert "Hoot" Gibson" for displayat the Astronaut Hall of Fame in Titusville, Florida, where it remains today. Continue reading at collectSPACE aboutwhere NASA has flown the 50-star flag since Mercury-Redstone 3.